Color enhancers are a very integral part of koi food. Koi must be fed a nutrient-rich diet infused with color enhancers in order to build up and sustain their brilliant colors. 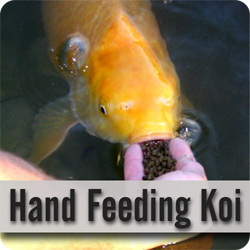 Every koi hobbyist wants their pet to look its best and most use an enriched food to improve koi color. After all, isn’t that why we keep koi, to enjoy their beauty? Several factors come into play when developing and maintaining the color of koi. One is the koi’s diet. Some koi enthusiasts think that koi food should never be made without the addition of color enhancers. You should offer a high quality food to improve koi color. However, there are good times and not-so-good times to feed color enhanced food. In order for koi color to become deep and lustrous they need to put on layer after layer of color. We often refer to this as the ‘depth of color’ when evaluating koi fish. Accumulation of color can be achieved by giving them food that includes color enhancers. But, it isn’t accomplished overnight. It takes time for the color additives in the fish food to show any noticeable results. A color enhanced koi food that is high in protein should be fed during the koi's primary growth period. That is when pond water temperature is above 70 ⁰F generally from late June thru August. This time frame is your window of opportunity for giving food to improve koi color. Why is my koi losing its color? Obviously, poor nutrition is directly linked to deterioration of koi colors. Offer your fish a food to improve koi color purchased from a reputable source. Feeding an inferior or low quality food is the fast track to dulling its hue, and loss of color and shine. Stress also causes color loss. If you are vigilant about observing your koi activity then you should be able to notice the signs of stress. Koi will always let you know when they’re not feeling well but you need to recognize the indicators. Are their fins flushed or appear pinkish? Are the koi scratching their sides against the bottom of the pond or rubbing on the edges? Gasping by the waterfall or hanging listlessly in the water is a sure sign of stress? Any kind of stress can cause koi to quickly lose their color. Poor water quality is one of the most common causes of stress in koi. If your water looks clear, don't be fooled into thinking that everything is fine. Water tests should be performed to determine what the stressor is. Koi also get stressed from breeding. Spawning is very traumatic for koi. The female koi can be relentlessly chased by male koi and even bashed about in an effort to induce release of eggs. Another factor that affects koi color is genetics. Some people in the koi world have said that the secret to having great koi is 10% genetics and 90% in the raising. You could say that the koi’s color is part nature and part nurture. If you put an award-winning koi into an environment with less than ideal conditions it will deteriorate very quickly and in time may even perish. Heat can also contribute to fluctuation in the intensity of your fish’s colors. Don’t let the pond water temperature get too high during the summer months. Providing some shade in the summer will go a long way in maintaining brilliantly colored koi. What are color enhancers in koi food? Carotenoids are the additives in koi food that intensifies the koi’s colors. For the red color especially, the supply of carotenoid pigments in the feed is essential. In nature koi eat living organisms like crayfish that are high in carotenoids and store the pigments in the body cells. Since crayfish are one of their natural food sources koi absorb the carotenoids from a very young age. 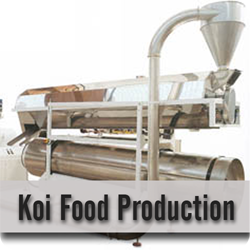 In commercially produced koi feed the colorants are added as animal and vegetable sources; krill and spirulina algae. Some other carotenoids that are blended into koi feed are beta-carotene, astaxanthin and canthaxanthin. Are there negative side-effects of color enhancing koi food? Beware that overfeeding color enhancers will adversely affect the white background of your koi. The white background can become yellowish or greenish tinged. This discoloration is normally a temporary condition that should clear up when color enhanced food consumption is reduced and is replaced by koi food which does not contain color enhancers.